My time with the latest preview build of Splinter Cell: Conviction transformed me from a stealth operations hater to a deadly master assassin, stalking dark corridors with deadly intent. Has the game changed, or have I? The preview build I played featured the first three levels of the game, which we've seen on multiple occasions, as well as the factory infiltration mission that Totilo played through in Tokyo last year. It also featured the co-op multiplayer story mode, covered by AJ late last year, and the Deniable Ops game modes, which are essentially four Splinter Cell-flavored mini-games. I've purchased and played every version of Ubisoft's Splinter Cell franchise over the years. What I mean to say is I've purchased the games, brought them home, played for an hour or two, gotten frustrated, and given up. I was certain this was because of my general aversion and ineptitude at stealth action games. As a 6'6" man weighing in at somewhere around 300 pounds, stealth just isn't in my blood. People hear me coming. The ground shakes, and they know fear. At least that's how it works in my head. Sometimes I play the Imperial March from Star Wars on my MP3 player to heighten the effect. But that's how I am, so when a game tells me to be quiet and hide behind a box for five minutes, figuring out patrol patterns, I start to twitch. Eventually I say "screw it," jump over the box, and go down in a blaze of glory, otherwise known as bullets. 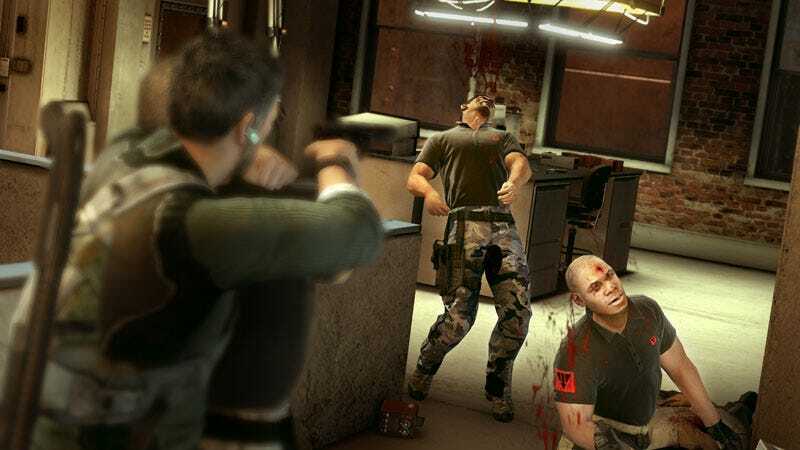 So what has changed between Splinter Cell: Double Agent and Splinter Cell: Conviction? Perhaps it's a combination the older, more brutal Sam Fisher and the strategically appealing mark and execute system. This is Sam Fisher unleashed. The Third Echelon is no longer pulling his strings, and his mission is one of personal vengeance, and that strikes a chord in me that the previous games never managed to touch. The mark and execute system is an extension of this cold, calculating brutality. Fisher has things to attend to, and he doesn't have time for extended firefights. Surveying an area and coming up with the most efficient ways to take out the enemies between him and his goal is a matter of necessity. It almost plays out like a puzzle game, or maybe even dominoes. In order to charge your execute skill, you first have to take out that one unwary guard - the first domino. You mark each successive enemy, with the number depending on the weapon you are using and the upgrades you've applied to it, and you've got the game set up. Take out the first, hit the execute button, and down they go, all in a row. The single player levels saw me gathering intel about Sam's daughter's killer, tracking him to a posh mansion, and then being "escorted" off-site by a strong military force, to a base I then had to escape. All of this accompanied by Conviction's unique projected text, guiding me on my way. I attempted to play through some of the split-screen co-op multiplayer story mode, but I ran into an immediate obstacle: I am only one person. Without the benefit of another person actively sharing my marks and helping me execute my enemies, I was quickly overrun. AJ had a much better experience with this in December, so I urge you to read her account for a closer look. What I did get to play by my lonesome were the two single-player friendly deniable ops modes. Hunter mode was pure bliss. You make your way through a map, charged with killing 10 enemies without being seen. After you dispatch them, you're given a chance to upgrade your weapons, and then advance to the next section, with another 10 enemies to kill. It's basically the core of Splinter Cell: Conviction distilled down into a quick and dirty, pick-up and play experience. Aside from being damn enjoyable, it's also an excellent way to hone your skills. I made it through two and a half waves before going down, which I blame on my hubris. I also played through a bit of the Last Stand mode. In Last Stand, one or two players take on waves of enemies while protecting an EMP bomb. IF you stick to the shadows, the enemies will focus on destroying the EMP. If you draw their fire, something that's generally a bad idea in Splinter Cell, they concentrate on you, and the EMP repairs itself. It's a game of cat and mouse, where you constantly strive to make yourself a juicier mouse than your enemies intended target. The enemies arrive in waves, and at times things got quite frantic. Until they destroyed the bomb. Then everything was eerily calm. The other two Deniable Ops modes are meant for two players. I did attempt Face-Off, which is spy vs. spy with AI enemies thrown in, but it wasn't quite as enjoyable as I'd imagine it would be with two actual players. I have a black Xbox 360 controller and a white one, and I'm obviously biased against the white, as that's the "player" I continuously killed. So all in all, there's plenty to enjoy in Splinter Cell: Conviction, which shouldn't be surprising to fans of the franchise. It is, however, surprising to me, a man who generally despises the stealth action genre. So have I changed, or has Splinter Cell changed? As I test, I tossed in Pandora Tomorrow into my trusty PlayStation 2. Over the course of an hour I died multiple times, turned off the system in disgust, and openly wondered why I still own Pandora tomorrow. No, there's definitely something different about Sam Fisher, and I think I like it.